Parliamentary elections were held in the country Georgia, and the political party called Georgian Dream won the majority. Bidzina Ivanishvili, the head of Georgian Dream, is expected to become the next prime minister of Georgia. The political party of Mikheil Saakashvili, the president of Georgia since 2004, did not win the majority. Saakashvili will continue to be the president of the country until next year when the presidential elections will be held. In Georgia, the president is the most powerful person in the country. However, this is going to change next year, when many duties of the president will be given over to the prime minister. Two years ago, some changes were made to the country’s constitution which will give more powers to the prime minister after the new president is elected in 2013. Ivanishvili is one of the richest persons in Georgia. He lives in a fancy glass and steel mansion (see image). He was born to a family with little money. Ivanishvili studied to be an economist, and made his money in computer, banking, and other businesses. 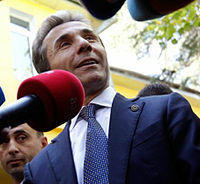 Ivanishvili has said that he will work towards improving Georgia’s relationship with its neighboring country Russia. Saakashvili and the Russian leaders don’t get along. About four years ago, disagreements flared up between Russia and Georgia leading to a five day war between them. The disagreement was over two regions in Georgia that wanted to break away and become independent countries. The Russians were supporting the people of these two regions. The relationship between the two countries has been strained since. Georgia’s official language is Georgian. Its second official language used to be Russian, until about two years ago. Russia and Georgia were both part of the same country called USSR (also known as the Soviet Union). In 1991, the Soviet Union started splitting into several countries, two of which were Georgia and Russia. The current prime minister of Georgia is Vano Merabishvili. Note how the three Georgian leaders’ last names end with “shvili”. Many last names of people from eastern Georgia end in “shvili”, and it means “child”. Georgia is famous for its wines – some of the earliest wines known to humans were made in Georgia more than 8,000 years ago. Georgia also has the deepest known cave in the world – the Krubera-Voronia cave. This cave is almost 2 kilometers (1.3 miles) deep, and explorers take several days just to get to the bottom! Last year, an old woman in the country Georgia was digging around for copper scrap to sell to make a little money when she accidentally cut an underground cable. Most people in the neighboring country of Armenia lost their Internet access for a few hours!